Beginning quilters will find that taking a few preparatory steps makes the Framed Nine Patch baby quilt pattern a cinch to assemble. Brush up on a few basic quilting skills before you begin. The only triangles you'll need to work with to make this quilt with are sewn in the corners of the Snowball quilt blocks, and they're quick pieced using a method that lets you sew with squares. The quilt's size is perfect for a toddler quilt and can be used as a lap quilt, too. Finished block size: 7-1/2" x 7-1/2"
Finished quilt size: 45-1/2" x 60-1/2"
Do not pre-cut all fabric for any quilt pattern until you've made a test block or two. Everyone makes mistakes -- me, you, everyone. Replace suggested colors with fabrics that match your theme. Fabric estimates are generous. Batting: about 55" x 70"
Sew a dark blue 2" x selvage length strip lengthwise to each side of a green strip of the same size. Press to set the seams. Always a good step to improve accuracy but I won't repeat it. Carefully press seam allowances towards the blue strips. Repeat, making an identical (but shorter) strip set from (2) dark blue strips and (1) green strip, each 31" long. Square up one end of each strip set and cut a total of (36) 2" segments. Set aside. Sew a green 2" x 37" strip lengthwise to each side of a blue strip of the same size. Carefully press seam allowances towards the blue strip. Square up one end of the strip set and cut a total of (18) 2" segments. Arrange two Step 4 segments and one Step 7 segment into three rows as shown, lower left of illustration. Sew rows together to create a nine patch unit, matching seam intersections carefully. Press. Repeat to make a total of (18) nine patch units. Sew 2" x selvage width dark blue strips lengthwise to opposite sides of the 5" x selvage width light blue strip. Press seam allowances towards the light strip. Repeat to make another strip set from two 2" x 31" blue strips and the 5" x 31" light blue strip. Square up one end of each strip set. Cut a total of (36) 2" segments from the strip sets. See How to Cut Patchwork Shapes if you're new to rotary cutting. If this image looks familiar, you might have seen in within the Framed Nine Patch quilt block pattern. The instructions for the single block are different -- it's assembled piece by piece instead of with strip piecing. 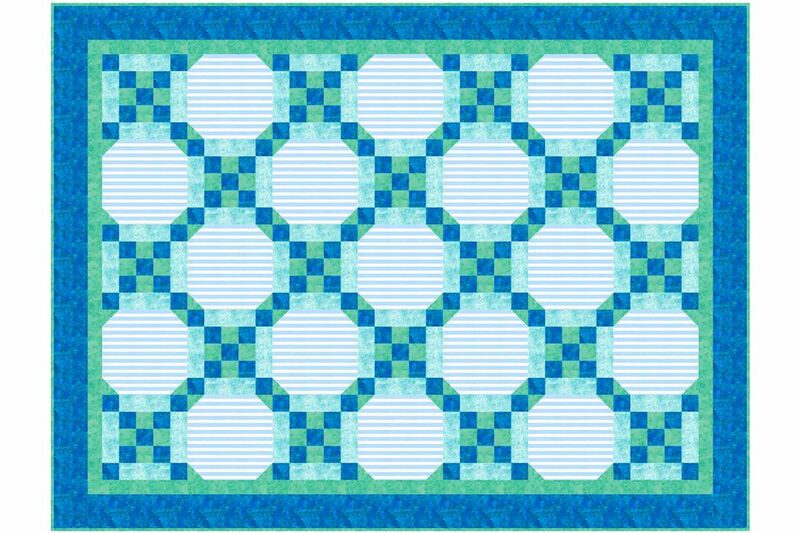 To make the quilt block's center row, place a 2" x 5" light blue bar on each side of a small nine patch unit as shown. Sew the bars to the sides of the unit and press seam allowances towards the bars. Use straight pins to secure fabrics. Sew a strip pieced dark blue/light blue segment to the top of the center row and another to the bottom of the row, matching all seams carefully. Press seam allowances towards the center (if it feels too thick, press the other direction). Press the quilt block. It should measure 8" x 8". Repeat to make a total of 18 Framed Nine Patch quilt blocks. Simple quilt blocks make great divider blocks and the Snowball is a favorite. Its triangular corners can be scaled to match any adjacent patchwork, linking with it to create diagonal linking in the design. Cut (3) 8" wide strips from selvage to selvage from the stripe reserved for Snowball block centers. Cut another strip that measures about 8" x 10-1/2". Square up one end of each strip and then cut a total of (17) 8" x 8" squares from them. Draw a diagonal line from one corner to the opposite corner on the reverse side of each 2" x 2" green square. Align a marked small square with a large striped square, right sides together, matching edges and making sure the drawn line is positioned as shown. Sew a seam on the line. Repeat in all remaining corners, taking care seams flow as illustrated. Press as-is to set the seam. Clip through both layers about 1/4" beyond each seam. Flip each new triangle right side up and press. The quilt block should measure 8" x 8". Repeat to make a total of (17) Snowball quilt blocks. Arrange the quilt blocks into seven rows as shown, alternating quilt blocks. Odd-numbered rows begin and end with a Framed Nine Patch quilt block. Even numbered rows begin and end with a Snowball quilt block. Sew quilt blocks in each row together. Press seam allowances towards the Snowball quilt blocks. Join the rows, matching seam intersections carefully. Press. Add borders. Use 1-1/2" wide strips of green to make the narrow inner border. Use 3-1/2" wide strips of dark blue to make the wider outer border. Be sure to measure for borders and sew them to the quilt as explained in how to Sew Butted Borders. Beginning quilters -- don't be tempted to measure your quilt along its outer edges -- they will be skewed. Adding borders is an opportunity to square up the quilt top. Sandwich the quilt with batting and backing. Quilt by hand or machine.